A serendipitous find beside the seaside, St Benedicts is nestled close to Burton St Leonards and is full to the brim with antiques, curios and objects. 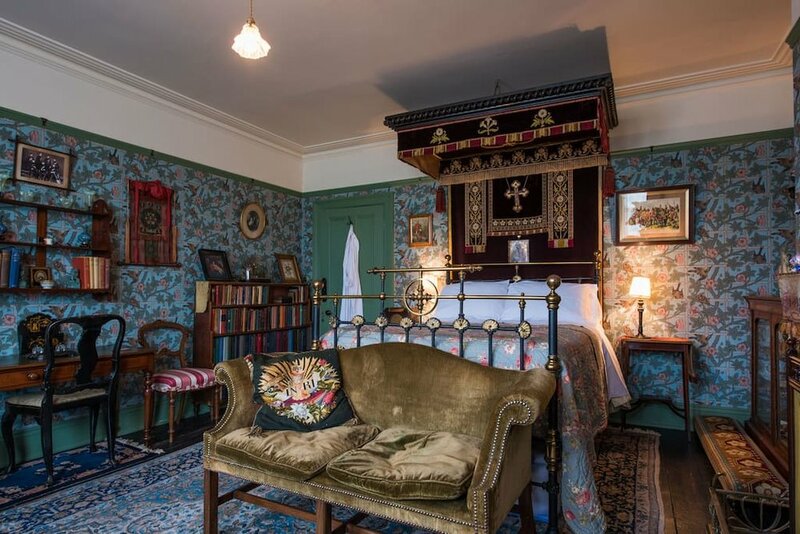 Every inch of the sprawling old house has been faithfully decorated with the kind of awe inspiring attention to detail that provokes closer inspection and invites the mind wander to other places and other times. "Pair of antique large and finely painted Chinese ancestral portraits in vibrant color and gilt on silk and presented in giltwood, of male chop mark signed/stamped lower right, circa 1890." The Chinese have long had a profound connection to their ancestors and believe that death does not sever a person’s relationship with the living and that, if properly worshipped and honored in private family rituals, their ancestors' spirits can bring them health, long life, prosperity and children. Chinese "ancestor paintings" are painted specifically for use in ancestor worship; the power of the living person is believed to reside in their portrait after death. Most of the ancestor portraits that have survived depict members of the Qing (pronounced “Ch’ing”) imperial families and military and civil elite who ruled China from 1644 until the revolution of 1911. 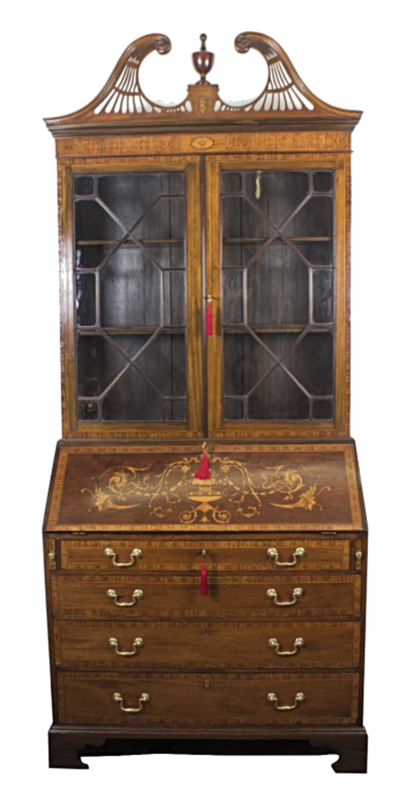 English Victorian mahogany and marquetry bureau bookcase, circa 1860 with satinwood crossbanding and decorative geometric scrolls, husks and flowerheads. "The upper part has a decorative pierced swan neck broken pediment cornice with acanthus scroll carving centred by an urn finial, the frieze centred by a satinwood ground panel with paterae, the two astragal glazed doors enclose an interior fitted with adjustable shelves." 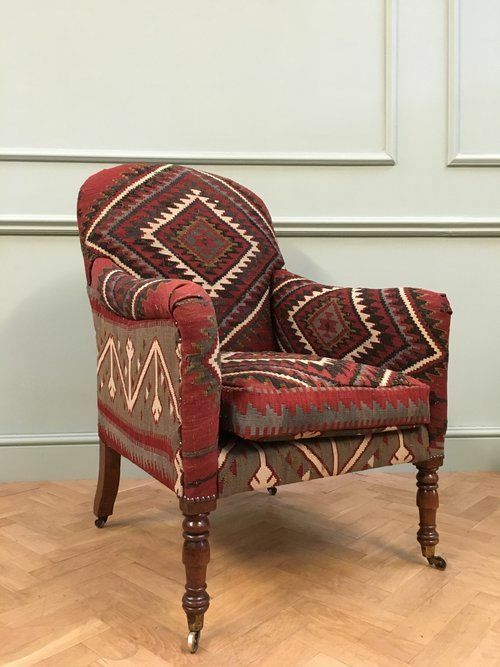 A circa 1820 armchair covered in a kilim. Kilims are flat tapestry woven carpets made from the Balkans through to Pakistan and bring a richness of texture and pattern to upholstery, as well as, being tough as old boots! "Hand crafted from start to finish using traditional upholstery methods and materials including using only the highest quality beech mortise and tenon frames." The epitome of old school design values with a focus on natural, sustainable, British materials. "An iconic wallpaper featuring a garden trellis with climbing roses and birds in blue, coral and green on a cream ground. 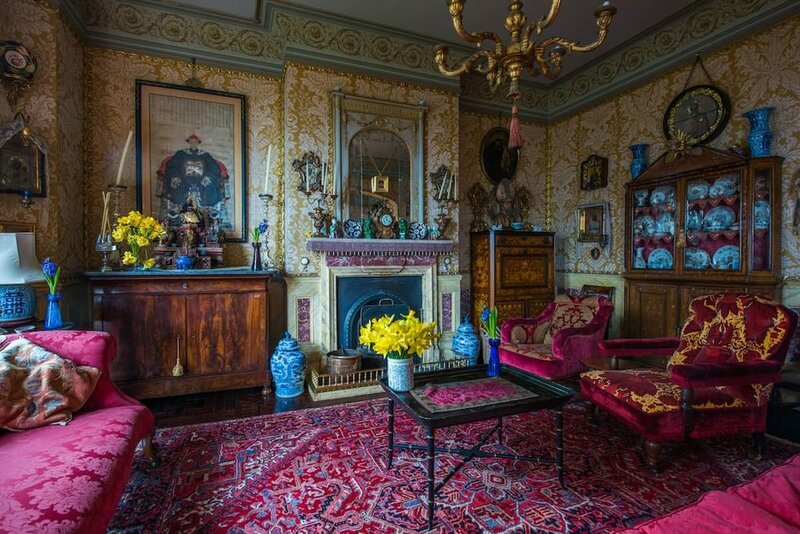 Designed by William Morris in 1864 and inspired by the courtyard garden at his home Red House." Sadly the same periwinkle blue as hangs in the Colonel's room at St Benedict's is no longer available. "Based on an Indian miniature taken from the back of a hand-painted postcard. Small hints of metallic thread add an oriental touch." Fine Cell Work trains prisoners to create beautiful pieces of needlework, their mission to foster hope, discipline and self esteem to allow individuals to finish their sentences with work skills, money earned and saved, and the self-belief to not re-offend. Sign up to receive tailored inspiration, advice and our latest blog posts.